It’s January! Which really should be called “The Month When The Gym is the Most Crowded”. Plenty of folks use the turn of a new year to hop back on the fitness wagon, and good for them! 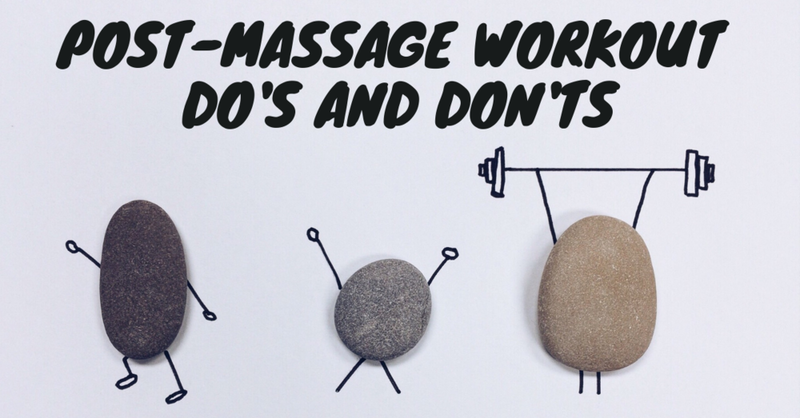 One question we get a lot from individuals who are either new to the fitness world, or hopping back in after a break is, “can I exercise after a massage?” We’re gonna break down the yeses and nos as far as exercise goes once you’re up and off the massage table. The rule is, across the board: it is best to give your body 24 hours of recovery time after a massage!! This means to avoid high energy, strenuous activity no matter how much you might want to after getting all those kinks and sores out of your muscles. For those folks who exercise heavily and often, you may be alright to do a light and leisurely workout. You know your body best, and can adjust to your liking. However, your main focus after a massage is to relax and allow your body to experience the full effect of the bodywork you’ve received. After a massage, your body may feel more fluid, or gel-like. The official term for this feeling is the “thixotropic effect” and it usually lasts about 24 hours, (hence the “no hard workouts for 24 hours” rule). While it can feel awesome, your body is a little more sensitive during this time. Strenuous activity while your body is experiencing the thixotropic effect can potentially pull tissue back to where it was, or introduce new pain. No thanks! Do yourself and your body a favor and get in a warm tub, drink some tea, and take a day off from the gym to thank your body for all its hard work. Is that out of the question? If you’re an absolute gym-nut who NEEDS the 6-7 days of exercise to maintain your happiness, then try to hit the gym before your appointment, and then plan your workout later in the following day.